Beware! The title of this recipe is rather misleading. I was looking forward to having a chilled, chunky textured, creamy potato salad; you know, the kind that's common at barbecues and cookouts. Alas, this is something entirely different, and is definitely not the down-home variety. In fact, I'd say this is more of the "ladies who lunch" or tea party potato salad. And semantics aside, let's face it: this isn't really potato salad, it's potatoes tossed with dressing. And that's fine, if that's the kind of side dish you're looking for...but don't say I didn't warn you! The dish is decent, and at least it's pretty simple and requires few ingredients. I adapted the recipe slightly from the original (no way am I gonna waste such a large amount of foil!) and baked the olive oil-coated potatoes in a 9x13-inch dish, covered tightly with foil for about 30 minutes. Once that's done, the rest of the recipe is just mixing the dressing. Whisk together olive oil, champagne vinegar (I used white wine vinegar), mayo (I used Vegenaise), sugar, red onions, celery, chives, and parsley. Toss this with the warm potatoes, and serve. Okay so the first no-no of this dish: it's served warm. Warm potato salad? Ehhhh. 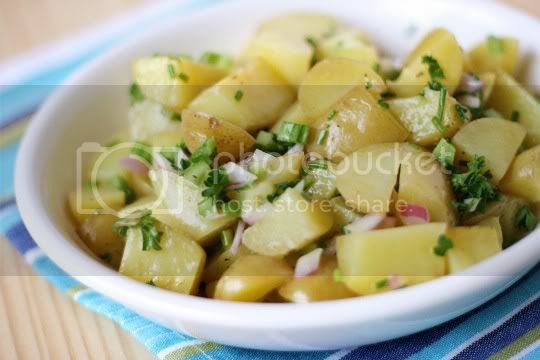 At least onions and celery are still included, which give it a nice crunch and are reminiscent of a typical potato salad. And at least the mayo is still there, although it's barely discernible. 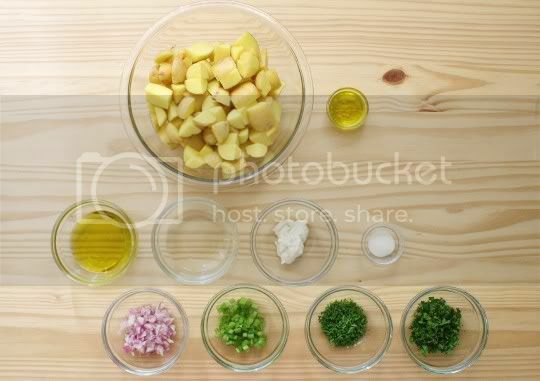 The main component of the dressing you taste is the tartness and acidity of the vinegar, as well as a pretty heavy olive oil flavor. The loads of parsley and chives add a nice herbal flavor, but I still can't help think how much better this would probably be if it were creamy and slightly mashed. You know, like a real potato salad. Make again? No. If you want potato salad, make potato salad. Vegan variation: Use vegan mayo.